PHILLIP I. GOOD, PhD, is Operations Manager at Information Research, a consulting firm specializing in statistical solutions for private and public organizations. He has published more than thirty scholarly works and more than 600 popular articles. 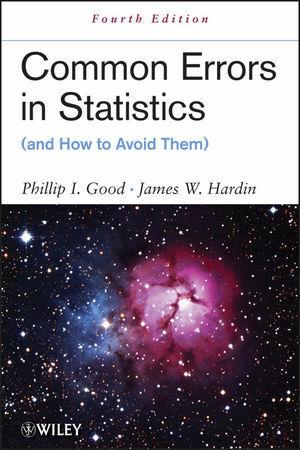 Dr. Good is the author of Introduction to Statistics Through Resampling Methods and R/S-PLUS®, Introduction to Statistics Through Resampling Methods and Microsoft Office Excel®, and Analyzing the Large Number of Variables in Biomedical and Satellite Imagery, all published by Wiley. JAMES W. HARDIN, PhD, is Associate Professor and Biostatistics Division Director of the Department of Epidemiology and Biostatistics at the University of South Carolina. Dr. Hardin has published extensively in his areas of research interest, which include generalized linear models, generalized estimating equations, survival models, and computational statistics. He is also an affiliate faculty member of the Institute for Families in Society at the University of South Carolina.